This project included some preparatory work analysing colour, texture and proportion (blogged 7-Sept-2012), then exploring the qualities of yarn (also blogged 7-Sept-2012), experimenting with structures with paper weaving (blogged 13-Sept-2012), making braids and cords (blogged 16-Sept-2012), weaving inside a shape (blogged 22-Sept-2012) and weaving in a grid (blogged 27-Sept-2012). Overall I really enjoyed the work. I tried to challenge myself with materials used and generally keeping out of comfort zones – I’d rate it a moderate success on that. Did you enjoy inventing constructed surfaces? Were you surprised at the results? 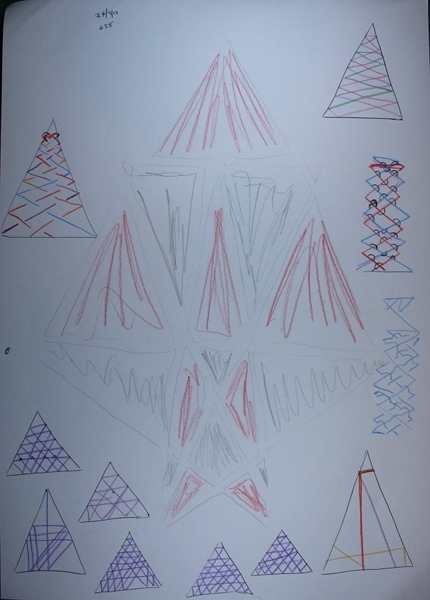 Can you see a connections between your choice of materials and the types of structures you made – regular, irregular, small or large scale? Which samples worked best – why? This assignment is much closer to textile work I’ve done in the past and I enjoyed it very much. I tried to approach each exercise with a fresh and open mind, very aware that even if in the past I have done something that seemed similar on the surface, the approach and purpose were quite different. For example last year I made a braid for a bag handle (blogged 30-June-2011). I wanted something strong that would not stretch and that complemented the handwoven material of the bag I had made. 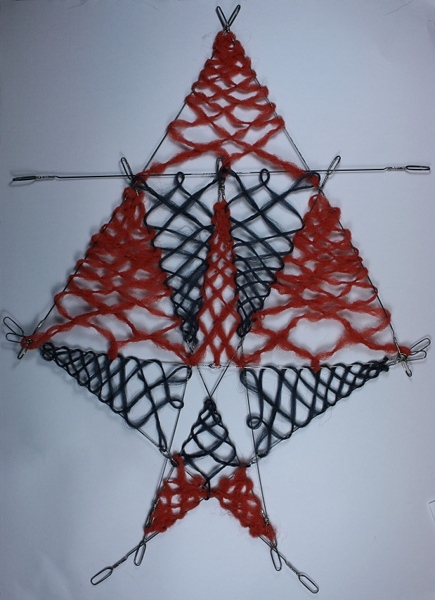 In this project I was making braids to express or contrast surface qualities such as sharp or bumpy or soft. Expression, not utility, was the goal. On reflection I am surprised at how satisfying it was to work with some non-traditional materials and how effective some of those results were. I see myself as a bit of a fibre snob, but would now add weed trimmer line and fibreglass window screen as good materials in the right circumstances. In some cases the choice of material determined the scale of the work. For example the rigid grid was made using wire heddles – a fixed size. At other times I worked to overcome or minimize a characteristic of a material. For example the weed trimmer line has a very strong curl. I ignored this when making yarn samples, and the resulting braids are still curved. The curl was impossible to ignore when trying to make a circle to weave in, and I eventually used the ironing press to control that characteristic. The scale of the paper strips when weaving made the original images, and their value, very important in the final results. I think this paper weaving is particularly successful. There is good contrast in colour and value, and I like the movement achieved by cutting along the lines of the field boundaries in the hillside scene. This means that both images are readable individually, while still making an interesting pattern as a whole. 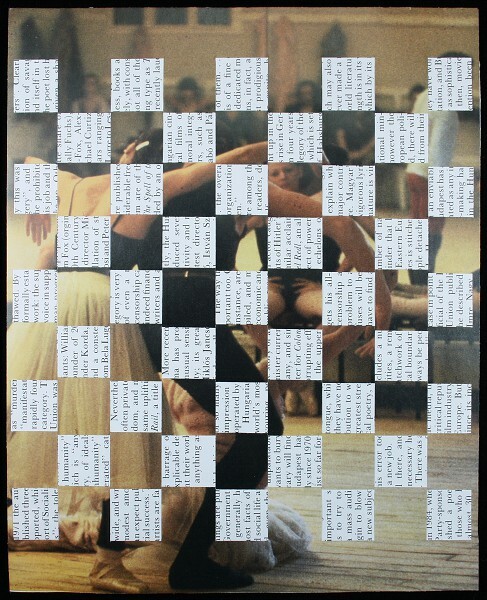 The links and contrasts in the original photographs adds additional interest and meaning to the weaving. The combination of shredded silver paper and acetate sheet also worked well. The unruly nature of the paper is still apparent even though ordered and controlled. The fragile paper is well supported by the acetate. 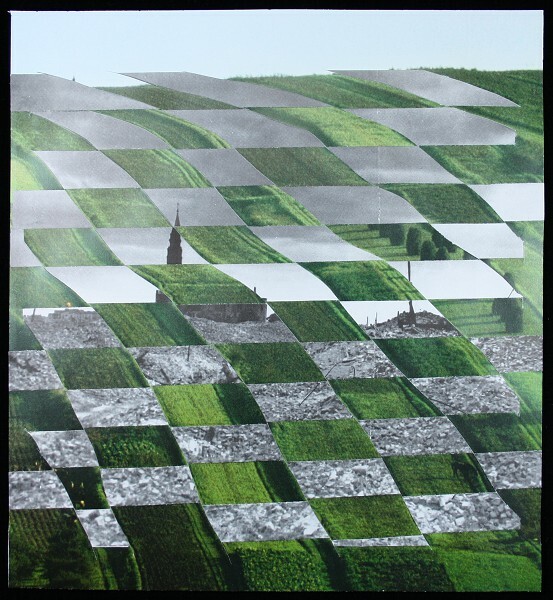 I like the contrasts of texture – the acetate and paper are both shiny, but in very different ways. On the left of this photo, the yarn made from fibreglass window screen is particularly effective in my view. I wanted to express “sharp”, and I think the result does look sharp and likely to cut. In fact it is quite soft and pliable. The yarn on the right, which used blue weed trimmer line and a black pvc tie material, has a nice contrast of visual density, for want of a better term. 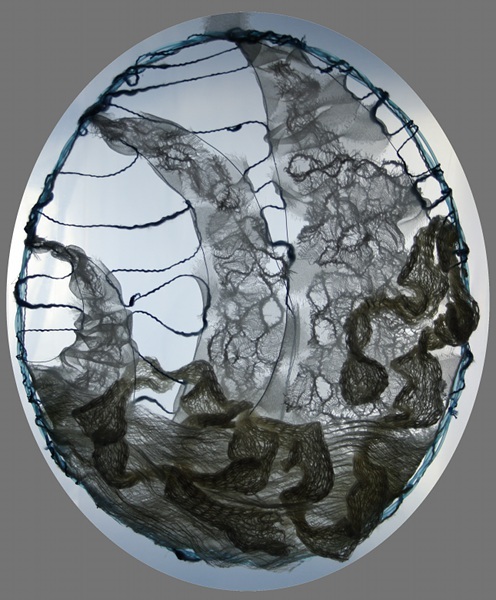 The pliable black wraps around and contains the transparent, fluid blue. There is lots of contrast in a coherent whole. How accurate were you in matching all the colours in your postcard: with paints? ; with yarns/other materials? I was disappointed with my colour mixing in this exercise. I had been working in watercolours in my sketchbook and started with those, but was unable to get the intensity of colour needed. 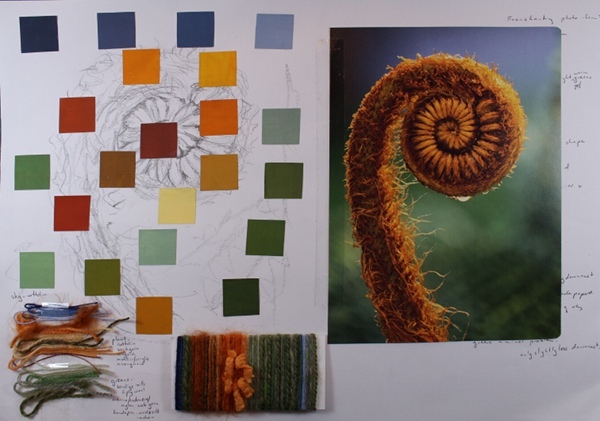 Matching colours with yarn was also difficult, given constraints of yarns available and the complexity of colour in some of my chosen images. My preferred approach in the past has been more approximate, going with my emotions / imaginings (for example “autumn” or “hydrangeas“) rather than strictly matching a particular image. Intellectually I know the matching exercise is good skill development, but it doesn’t come easily to me. Finally the course notes remind me to keep working in both sketchbook and theme book. Sketchbook work has continued most days, although I’m a bit behind in uploading it. However my tutor recently commented that sketchbook work doesn’t necessarily have to be in conventional drawing media, and that I should use whatever works best for me. I’m going to have to think about how to pursue this further. My themebook has not progressed much lately. It’s hard to keep everything on the boil at once! So this is a good reminder that I need to balance time and effort, keeping all the different parts of the course moving along. 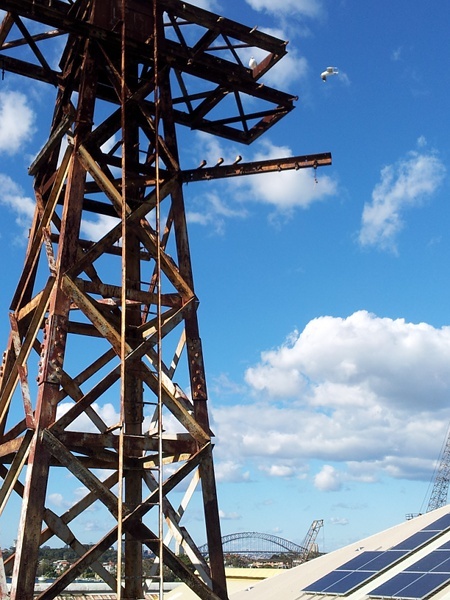 I took a number of photographs of this structure on Cockatoo Island when I visited it with Claire during the biennale. I did some work in my sketchbook (here) and was thinking about filling the spaces with some kind of exploration of rust colours and texture (I’d done a little on rust using stitch back in project 2, blogged 24-Oct-2011). It took a couple of evenings wandering vaguely purposefully around the house looking for suitable rigid materials, but eventually I found a bundle of metal loom heddles, scavanged from a Guild clearout. It seemed a nice twist to make a weave structure using loom parts. 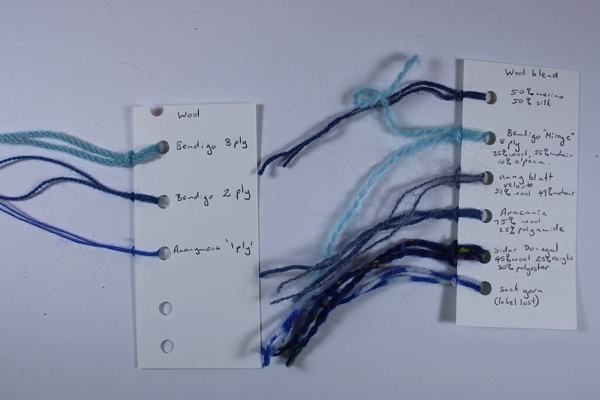 The heddle eyes and the loops at each end helped to combine the heddles to create a grid, and after a lot of experimentation and false starts only a few twists of wire at key points were needed to provide some stability. I was pleased with the shape I came up with – more reminiscent of electricity pylons than the original image, but still pretty nifty I thought (unfortunately I forgot to photograph it bare). 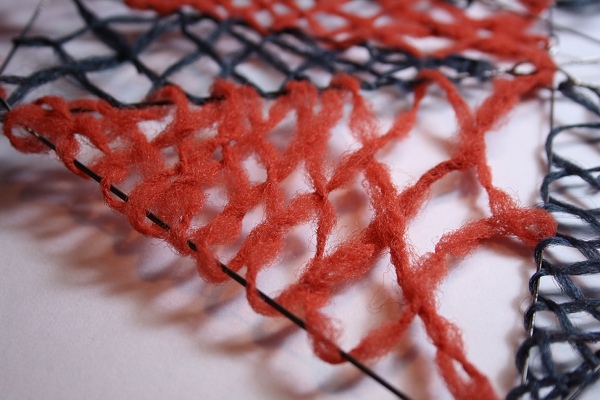 It had such interesting lines and odd shapes that I decided to be very simple in the weaving. It took a lot more experimentation, both on paper and in attempts on the frame, to get a method that worked. The multi-colour diagram on the left of this sketchbook page, towards the top, was the final design. Even once I’d figured it out I kept going wrong in the weaving, since I was using a single length of yarn and kept losing track as I worked up and down each triangle. In the end I carried along extra yarns in the different colours as I wove so I could identify each pass, then removed them once the weave was formed. I used one of my challenge yarns from Reverse Garbage – not actually for additional challenge, but fortuitously it was in a colour and with a texture that suggested rust. It’s definitely synthetic – possibly a type of nylon, but I have no idea of its original purpose. I also used a blue version of the yarn to create a counterchange pattern, providing some extra visual interest while highlighting rather than obscuring my nice grid. I could pretend that the blue was echoing the colour of the sky, but really it’s just what I had. I’m actually really pleased with this, although it’s a very odd thing. I’ve considered bending down those protruding wires near the top. 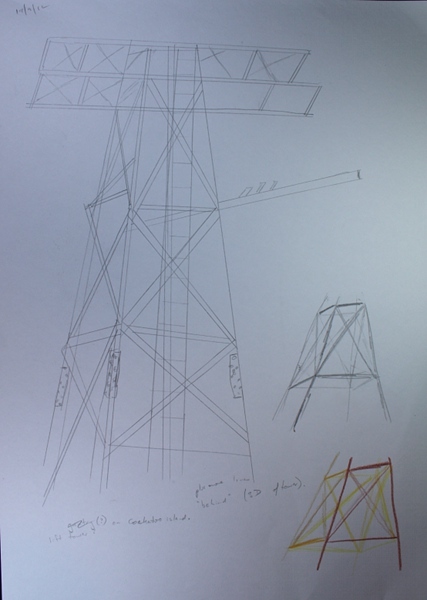 A 90 degree angle could increase the suggestion of electricity pylons. In the end I’m too attached to the idea of the integrity of the heddles – ten altogether I think. It amazes me that they could be fit together without modification to create such an interesting set of shapes. The choice of a simple weave worked well. It meets the exercise brief, fits with my chosen source image, and doesn’t obscure the grid shapes. I also like the way the spaces in the weave structure vary in size, just like the grid itself. Plus I’m pleased with my process, a good mixture of planning and experimentation, not losing sight of my source but not slavish and literal. It’s not a thing of beauty, but it does have interest and in my eyes a kind of oddball charm. 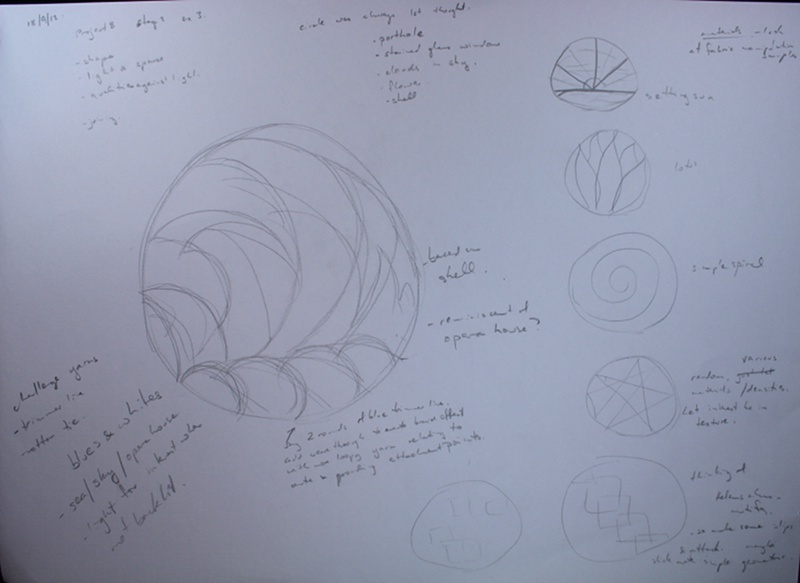 The goal of this exercise was to make a rigid shape, then weave within it, thinking about the effect of light and space and selecting materials for their qualities against the light. I decided quickly on a circle. I was thinking of the round braid using weed trimmer line in the last exercise (blogged here, 16 September) and on the right in the thumbnail photo. I could substitute something more suitable than the black tubing and try to make the braid into a circle. Light through the blue line should be a nice effect, I like the idea of building on work in previous exercises, and the multiple strands would provide lots of attachment points. Next I played around with a few ideas for shapes within the circle. 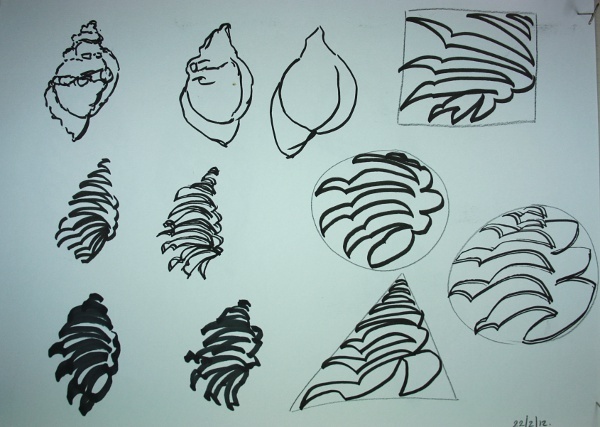 One reminded me of some of my earlier shell sketches back in sketchbook 2 in February, so that was my base. 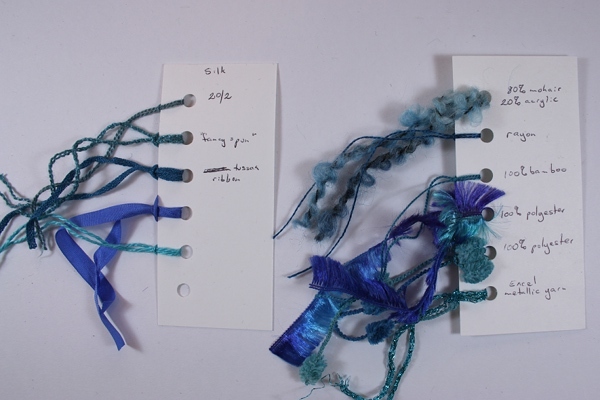 For colour, blues and whites – thinking of shells, sea, sky and (looking at the sketch) the opera house. My challenge “yarns” would be the trimmer line and some cotton tubular knit sold at the hardware store for plant ties. I liked the silk tissue in my pleating samples (blogged here on 13 August), so that could work in the “sails”. The ideas came quickly – not so much actually doing the work. First the trimmer line was totally uncooperative and curly. A run through the ironing press resolved that. I don’t think I achieved a 4-strand round braid structure in the circle. I tried to make a circle of one strand then add in the rest one by one. Very confusing. Another time I think I’d try doing a normal braid then splicing the ends to form the circle. I intended to use the trimmer line to form the edges of the “sails”, but it was too strong and distorted the circle. I used a blue 26 guage wire instead – a bit light really, but it coped. I used a white cotton/viscose yarn in the round braid, and a blue of the same type in a very way between the sails. In the first attempt I wove torn strips of tissue silk between the wire supports. I wanted to create the lower rounded shapes by putting something in the cotton knit tube, but nothing looked good except silk cocoons, and I’ve done that in a previous exercise (also based on the shells, blogged here on 16 August). Then I got very excited when I tried stretching out parts of the tube – it formed lovely swirly lines like brain coral. I went a bit crazy, covered about half the circle with it. Finished! – except it was totally unbalanced and boring. The sails were half covered, and the parts visible were boring – the silk was flat so there was no texture or interest. The knit tube was just out of control. Eventually I took out all the silk and the cotton tube. I made some textured lace-like strips by free-machining over some cheesecloth, based on the class with Helen MacRitchie (blogged here, 15 September). Only a week ago but I forgot about putting it into a hoop – no wonder I had trouble and got a different effect!! The cut strips of cheesecloth sat between the wire outlines of the sails, and I wove over then using the tissue silk. Much more interesting! By this time I was thinking more of waves than shells. I found some … I think it’s mulberry bark paper – and used that across the base, poking holes in it so I could weave through the cotton tubing – in much more restrained amounts this time. The backlit view above shows some distortion of the circle as it hangs. I think the final selection of materials worked well together to form interesting textures against the light. The (eventual) water theme is apparent, without being too literal. I was able to use my source material, but not be bound by it. The braided circle provided good anchor points as anticipated. Compositionally I think it’s close but it doesn’t quite work. The sails are a bit misshapen and clumsy. The boundary where the mulberry bark paper meets the sails is rather abrupt. The blue “sky” lines look lost and forgotten. 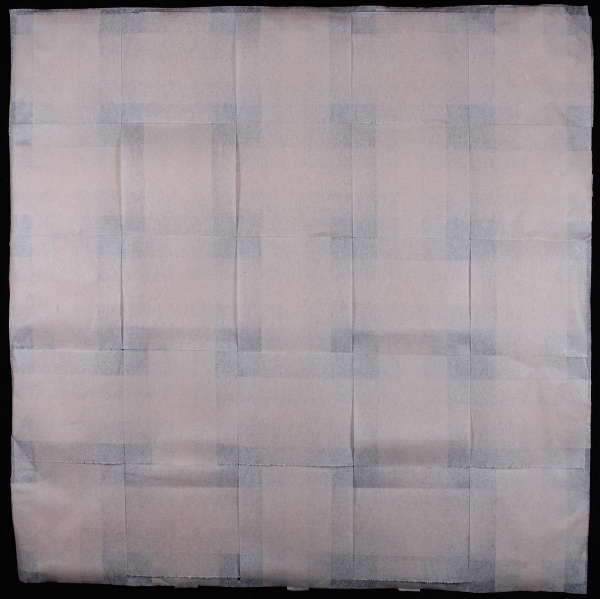 I chose the tissue silk because of the nice effect when pleated – and then didn’t pleat it! It is much, much improved from the original version, and I’m very pleased that I put in the extra time and effort. 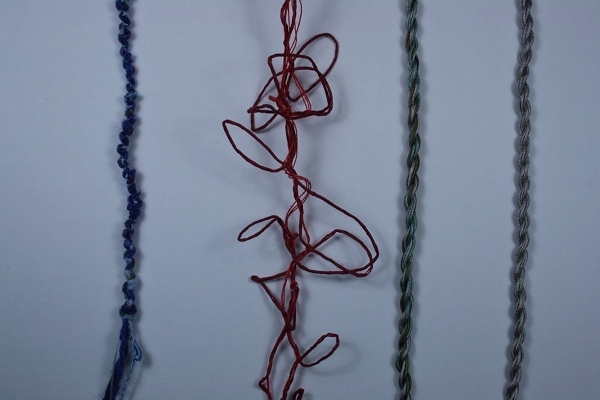 This exercise involved trying to interpret surface qualities in hand-twisted ropes and some four strand braids. 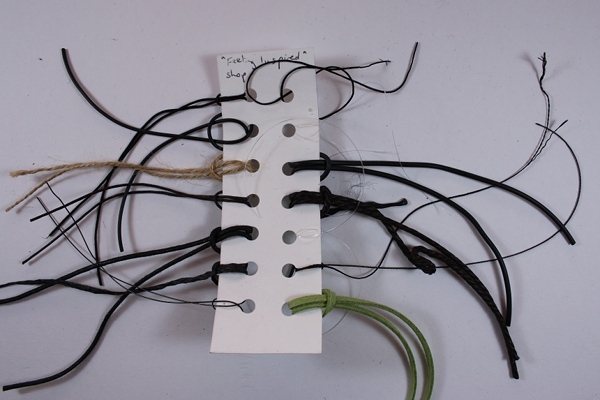 This is the base set of structures, all using jute twine and neoprene tubing. 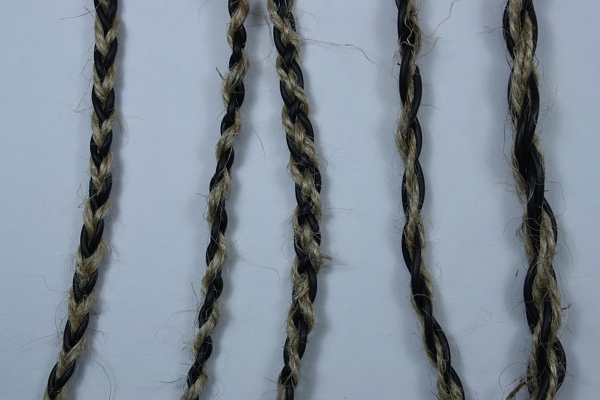 From left to right, four-strand chevron braid, four-strand round braid, four-strand flat braid, hand-twisted rope (4 strands in final rope), hand-twisted rope (8 strands in final rope). In this initial set I wanted a contrast in colour and texture of materials, but similar grist. Once I had an idea of the basic structures, I tried to think of a texture then select materials and structure that might combine to give that texture. Soft, uneven texture. Silk throwsters waste that I gently attenuated to form a fragile but continuous length, in 4-strand chevron. The end result is much stronger than the individual elements. Soft, even texture. Merino tops in 4-strand flat braid. Even though the colour varies, I think the overall texture is even, soft and smooth. Shiny, rough texture. This is gold lamé fabric strip with frayed edges, combined with a bundle of fine gold threads (a weaving warp that got in a tangled mess when I attempted to beam it), in a 4-strand round braid. The round braid worked to maximise the spikiness of the rough gold. Shiny, smooth texture. 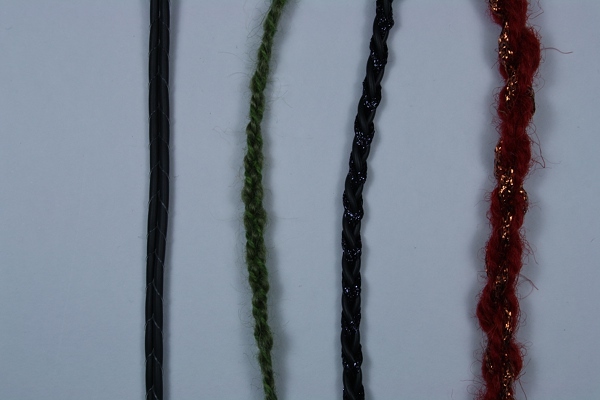 Multiple strands of two colours of anonymous plastic fibres (they came in a bundle looking like artificial horse hair, from Feeling Inspired) in 4-strand flat braid. In life it does look shiny. A repeat of the merino structure, it’s interesting to see one looking so hard and the other so soft. Bumpy. 1 strand each of Paton’s Sorrento (cotton/viscose), Sidar Donegal (wool/acrylic/polyester), Patons Cottontop, elastic thread (anonymous from Feeling Inspired), in 4 strand round braid. I kept tension on the elastic thread while working. Combined with the textured threads this gave a very nice bumpy result, which also has an interesting stretch. Sharp. Paper yarn and fine cotton. I tried to fold up the paper yarn, maintain the folds by holding it between groups of fine cotton, then create a hand-twisted rope. The result is highly unstable and not at all “sharp”. On the other hand, it makes a lively line. Smooth ripples. I was imagining a smoothly flowing water effect. This is some fine braids (anonymous yarns from Feeling Inspired), combined in a hand-twisted rope. The result is attractive, but not “smooth”. Smooth ripples – attempt 2. The same as the previous attempt, but only one colour used. This is more successful. Contrast of scale. Neoprene tubing and fishing line. I had a few attempts with the standard exercise structures, but couldn’t get a good result. This version which keeps the neoprene neatly side by side is not quite as boring in real life as in the photo. Contrast of fibre. This is hand-spun mohair and cottolin in a 4-strand flat braid. Ho-hum. Contrast of shiny and matt. More neoprene, and Maderira Glamour thread (viscose/metallic polyester). My notes don’t say but I’m sure this is 4-strand chevron braid. This is very attractive – subdued elegance. Contrast of shiny and matt. Hycraft rug wool and Excel metallic yarn in a hand-twisted braid. I like the extra element of roughness in both the shiny and the mat elements. I finished all the above a couple of days ago, but “sharp” was bugging me. So today I visited the local ginormous hardware store and wandered around looking for potential “spiky/sharp”. Sharp. This is fibreglass flyscreen in a 4-strand round braid. I cut a strip off the flyscreen mesh, then stripped off threads along the edge to create spiky fraying. The round braid was chosen to maximise and accentuate the “sharp” edges. 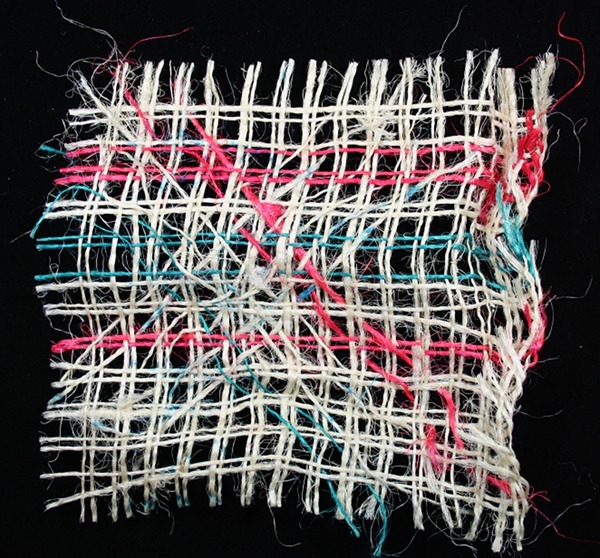 There are two strands of the frayed material, and two strands made up of a small bundle of the fibres removed in the fraying process. I think this looks like it could catch and cut your fingers – sharp and dangerous. In fact it is quite soft to the touch. While doing OCA work I’m always mindful of postage implications – weight and the possibility of damage to or by an item. If I’d bought the aluminium flyscreen it may have felt as well as looked sharp. Hard but smooth. 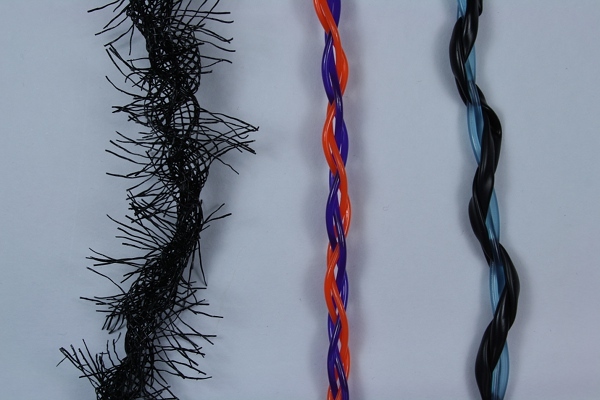 This is orange trimmer line – hard plastic – and anonymous purple something from the bottom of a drawer, in a 4-strand round braid. I didn’t have a texture in mind for the round braid on the right. It uses black soft flexi-tie (plastic of some kind I think) and blue trimmer line. Both materials came from my hardware trip. I was curious to see how the very stiff trimmer line would combine with the pliable, soft tie. Would the actual physical hard and soft contrast be apparent in the combination? The result looks like a core of transparent blue with the black coiling around it. In real life the blue is shinier. I really like the overall effect. The final set all use audio cassette tape. I’ve seen it used in a few things recently, but no links because I can’t recall any specifics. The tape is a beautiful smooth, shiny ribbon. Above on the left I did a simple hand-twisted rope. The result is bouncy and shiny, but doesn’t really add anything to the base material. 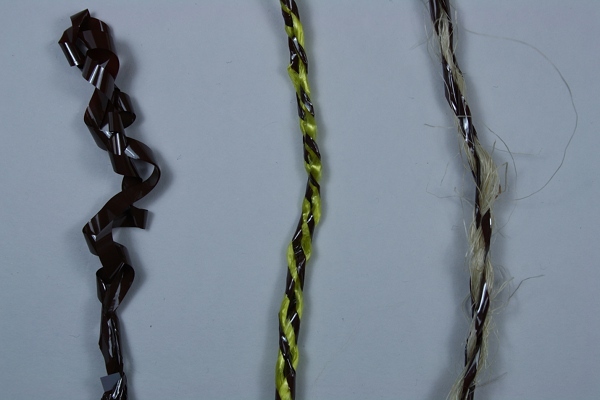 In the centre is audio tape in a flat braid with yellow garden twine. The tape is all squashed and folded, and there is too much shine in the twine to give a contrast. 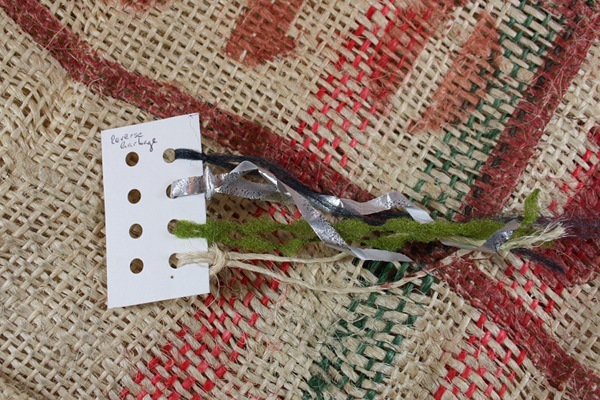 On the right is the tape combined with a weft thread taken from a hessian coffee bean sack. I tried flat, round and a sort of modified just-trying-to-make-it-work braid, but they all seemed to squash/fold/deflate/minimise the tape. Finally I carefully wrapped the tape around the hairy thread, keeping the tape flat and at a low angle so there was a lot of space between each wrap. I used the result to make a twisted cord. I think this is the most successful experiment in terms of retaining the smooth ribbon nature of the tape and contrasting it with another yarn. I found this exercise very satisfying. I was able to use a wide variety of materials, pushing a few personal boundaries, and in most cases I think the results reflect the texture inspirations. This exercise begins our exploration of structure with paper weaving. For my first few experiments I worked with pages taken from an old Time-Life book on Eastern Europe. Sample 1 was a failure. 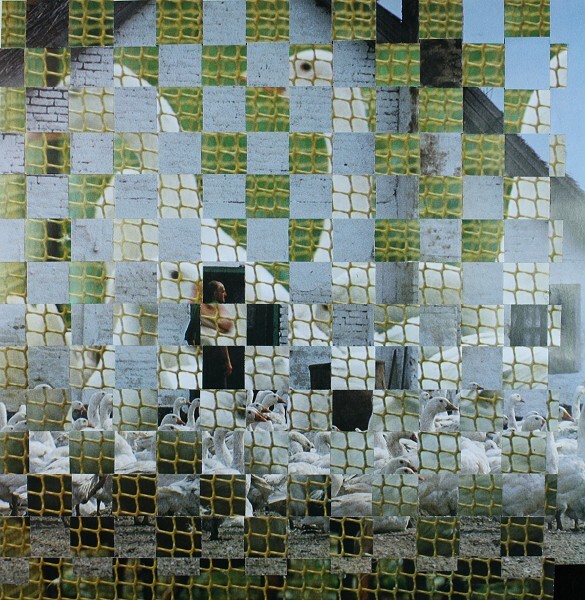 I used two photos of geese – one a closeup through a mesh fence, the other a more distant view of geese in front of a farm building. I thought the differences in scales of the images would be interesting, and that the mesh fence would add some sort of counterpoint to the grid of the weaving. Instead it’s a mess, virtually impossible to process visually. Like Claire when she did this exercise (here), I found the back more interesting (nowhere near as interesting as her’s, but such is life 🙂 ). Value is clearly very important. This is different to weaving a scarf or similar, where the smaller scale of warp and weft means that there’s a lot more optical mixing of the different colours, and no concept of trying to read individual images. Of course there are other weaving techniques, such as the Theo Moorman inlay used by Daryl Lancaster (see her blog including here – weaversew.com/wordblog/2008/12/20/big-sister/) and Ann Roth’s work using strips of fabric she had dyed (here – annrothtextiles.blogspot), where scale and structure mean the image or pattern of the materials remains visible in the result. I tried to adjust for the value problem in my second sample by using a coloured photo as “warp”, unrelated text for the weft, and a larger strip width. The photo is easier to interpret, but it’s not enhanced or given any additional meaning or depth by being woven. This third sample combines two photographs. The black and white is Warsaw after it was levelled by the Germans in World War II. The colour photo is fields in Poland. I cut the strips of the warp to follow the lines of the field boundaries. I think this is easily the best of this series using photos. Each of the images can be understood separately, and combine to give enhanced meaning. Following the sloped lines in my cuts makes the images easier to interpret and also adds some movement to the result. In my next sample I cut and layered strips of tissue paper. The thumbnail above shows the very uninteresting back, and the larger photo to the right is very subdued. Sydney is rainy and grey this afternoon, so I’m back to the wobbly, handheld in front of a lamp style of photo. 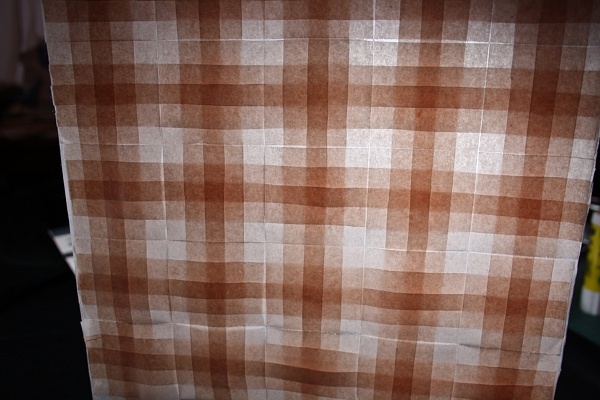 This is just the effect I was trying to achieve (the weaving, not the photo). I like the idea of hidden meaning or interest that is only revealed in certain conditions. The course notes suggest trying variety and contrast in materials. I decided to bring in one of my “challenge” finds from Reverse Garbage, shredded silver paper, as weft. For “warp” I took a piece of acetate (previous life the front cover of a spiral bound book), and cut 2 cm wide slots in it. This is a very tricky thing to photograph in artificial light, so I’ve put in a couple of attempts – sorry about the reflections. There isn’t actually any gold or yellow in it. 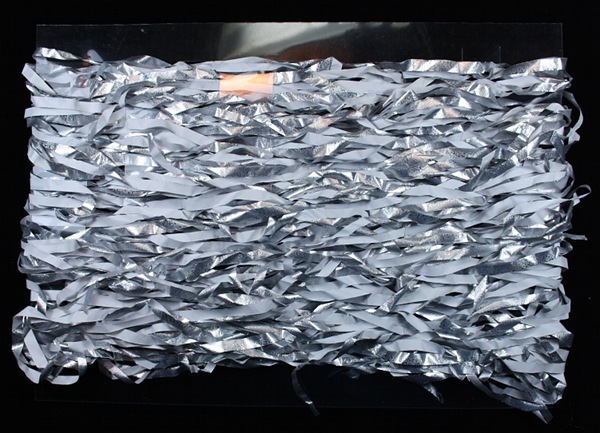 My biggest concern was to retain the liveliness and rather wild nature of the shredded paper, but in a form that somehow contained/controlled it and added some strength. I think it has worked very well, although it will be interesting to see it after it has been compressed in the mail a couple of times. All the structure comes from the acetate – it remains a single piece with the paper woven through the slots. 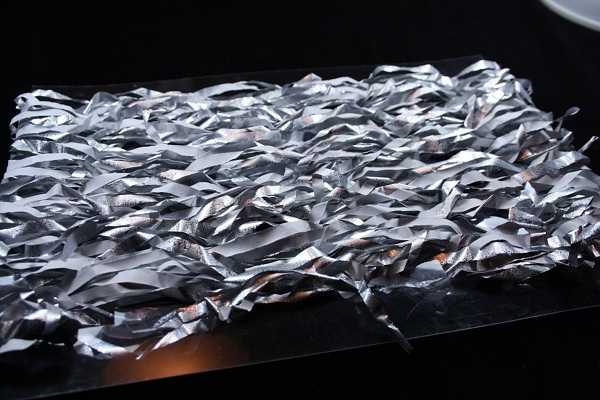 I wove with a continuous bundle of paper, wrapping around the edges of the acetate. Note the word bundle – I didn’t even attempt to separate the strands, just gently pulled out a handful and kept pulling, capturing extra bits as required to keep the bundle a roughly even width. My final samples also come from my challenge purchases, this time a roughly woven bag that I think was used to ship coffee beans. I cut a piece that had some interesting colour, both from the warp stripes and the overprinted labelling on the bag. 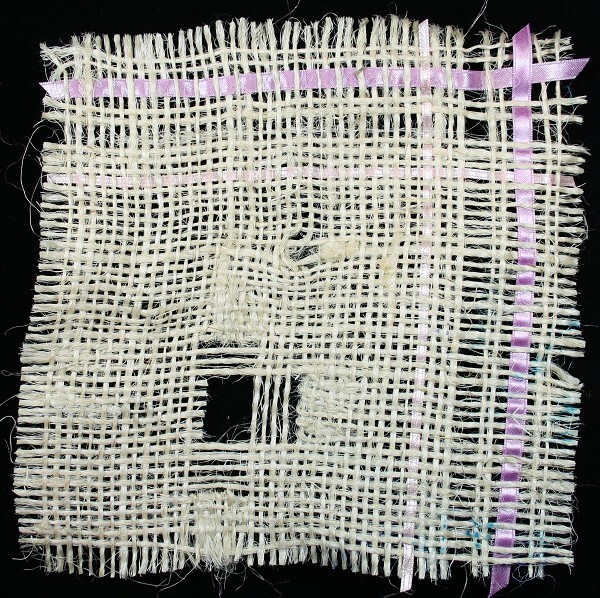 My intention was to follow the note’s suggestion “make a more open weave and then weave across diagonally with threads or paper”. Obviously I’m already bending the requirements somewhat, given I started with a woven fabric. 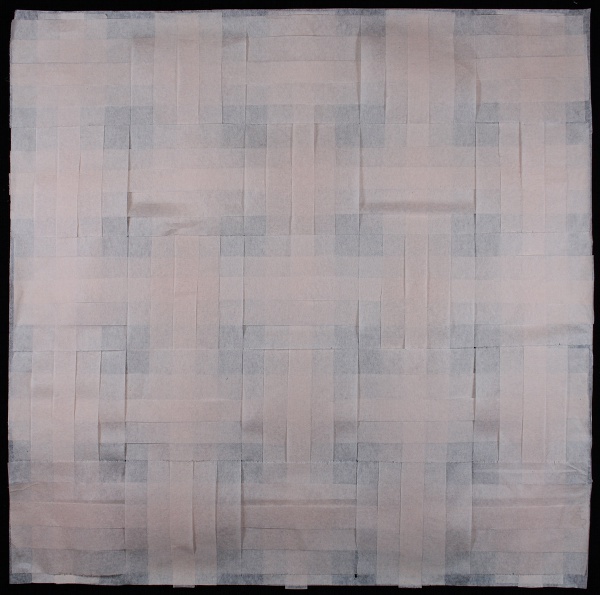 The plan was to make the fabric more open by removing threads from both warp and weft. I was going to weave diagonally over this, using the threads that I had reclaimed. 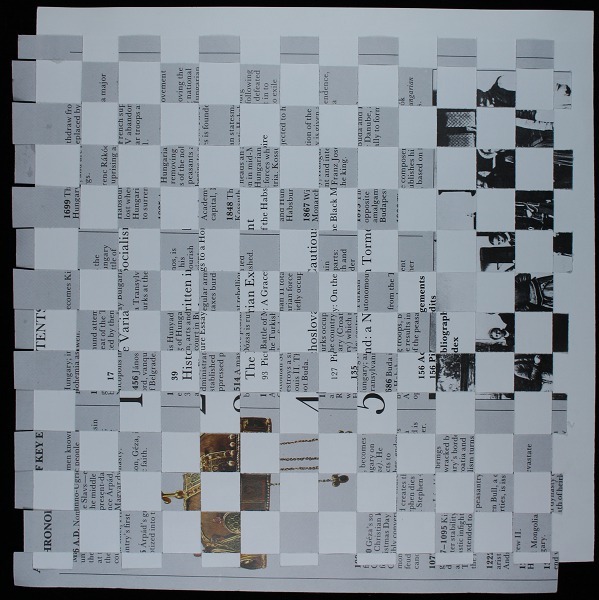 I tried to keep the removed threads in order, with the idea that the overprinted text might be vaguely visible in the reconstructed, reintegrated, diagonal over-weaving. Above is the result at the time I stopped. The photo is doing it favours – it’s really just a muddled mess. Perhaps it’s a variant of the same problem as with the geese right at the top in my first sample – there isn’t enough contrast between my elements for them to make sense visually. At this time I was also in a mode of trying to be spontaneous and intuitive in my sampling, rather than planning everything up front. I ran into trouble because in my mind weaving is so much about structure, and working on the fly I couldn’t figure out what weaving through diagonally meant – at least not in the sense I was attempting, of creating a second layer like in doubleweave (there’s an early example of this from 2008 here, or you can click on the Structure/doubleweave category on the right to other versions). My final example is included for completeness, since this is my learning log and I like to be open and honest about failures as well as successes, but it’s not going anywhere near my tutor or formal assessment. Shudder! 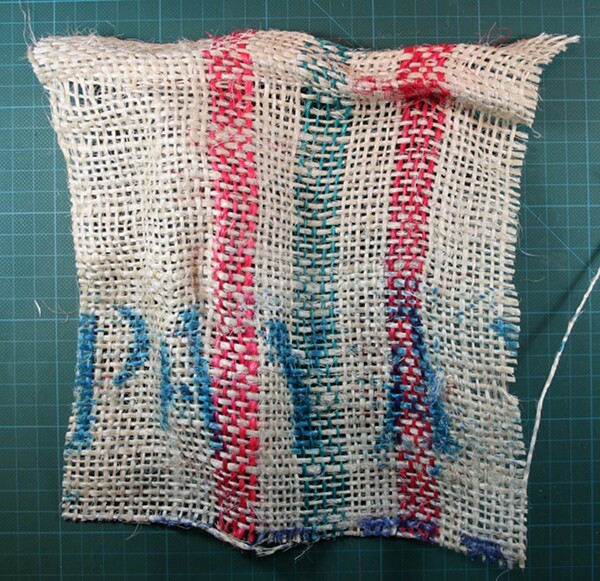 Having abandoned my diagonal double woven mess, I cut another piece of coffee bean sack with the thought of taking out more threads, but this time cross weaving in a contrasting material. After a while it occurred to me that it wasn’t interesting, it was never going to be interesting, and even worse I’d drifted entirely away from the requirements of the exercise. 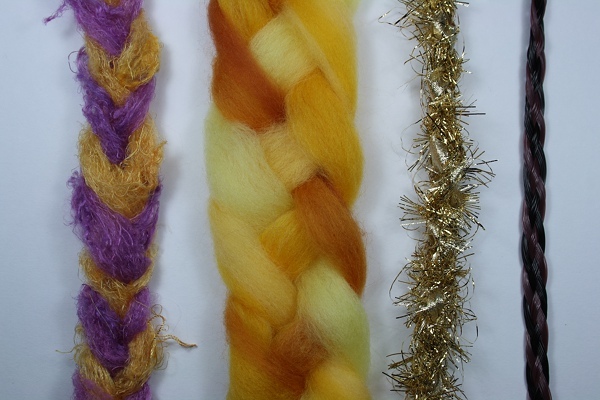 This stage introduces the student to the different properties of yarns, looking at the three main categories of fibre – natural fibres, man-made fibres and regenerated fibres. Step one was to group my yarns by colour. I’ve never won a conversation about stash size. I’ve met a couple of people who keep to a very small stash. Mine isn’t small. It isn’t large either – I know lots of people with much bigger stashes. It has until now been mostly sorted by yarn content and size or by purpose – for example Bendigo 2 ply wool (a great weaver’s starter yarn), or various sock yarns (knitting keeps the fingers busy when the brain is tired or otherwise occupied). I am gradually learning to trust the OCA course and process, so I gulped a few times and did it! I sorted by colour. The photo above shows a 50 litre tub of blue. I have six colour tubs (yellow, orange, red…), one white and light neutrals, one black and dark neutrals, and one mixed colours. I didn’t entirely let go. 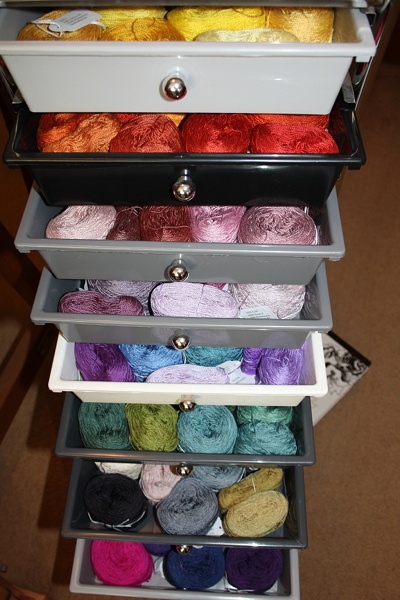 My hand-dyed 20/2 silk stayed in its little trolley and skeins of undyed silks of various types are safe in a cupboard. Still, so far I’m liking it. After all, it’s easy to go through and pick out all the cottolins if I need to, and it certainly made the last exercise on colour matching and yarn winding (blogged this morning) easier. 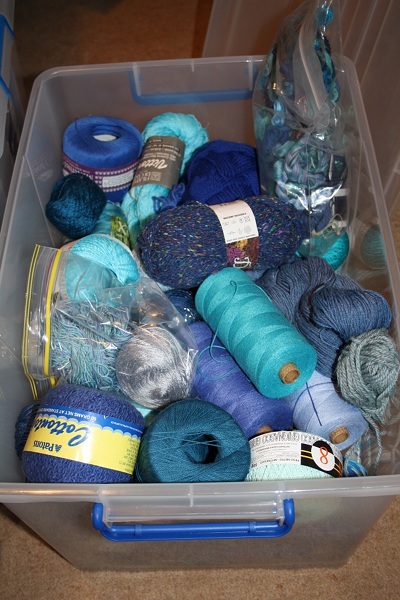 As well as collections of particular yarn types for weaving I’m a gatherer and hoarder – so there are bits and pieces picked up at sales, at clearouts by other fibre people, big cones of fine cottons (a machine knitters meeting I wandered into), mill ends, lots of anonymous stuff. 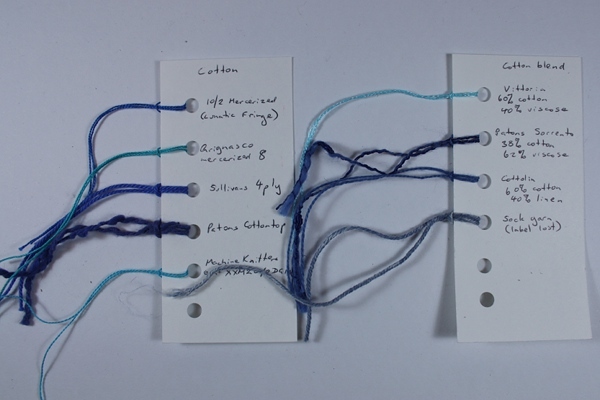 I spent some time going through the blue tub and made up some little cards with samples where I knew the fibre composition. There’s another card with some basics which I don’t have in blue – linen, paper, raffia – plus things I’ve picked up in the past from the hardware store. The tricky thing with all this is that I tend to think I know these yarns, at least some of their properties, what they can do, how to work with them… In one sense I do, in another I’m in a new situation and doing new things, so what I used to know isn’t relevant. I’ve never done tapestry weaving. 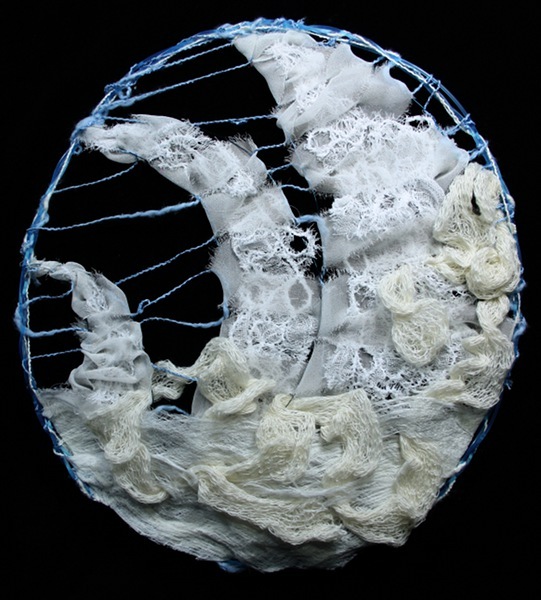 I have tried to go from visual source to finished object (particularly in Meg‘s P2P2 challenge – my project here), but I need to take it to a whole new level. That’s why I’m doing this course, after all! 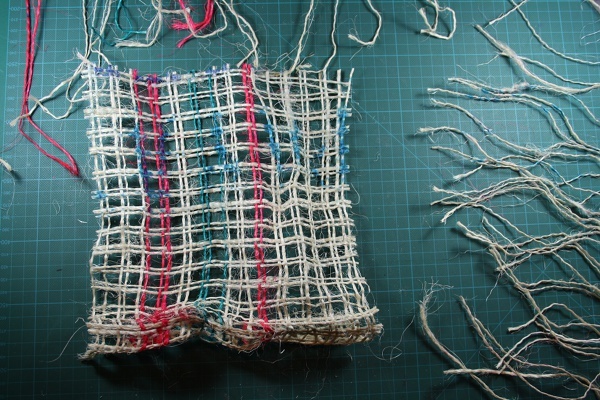 I want to force myself out of any comfort zone, so I went to Reverse Garbage looking for weaving materials. This co-operative takes industrial discards and sells them to the public – landfill diverted. 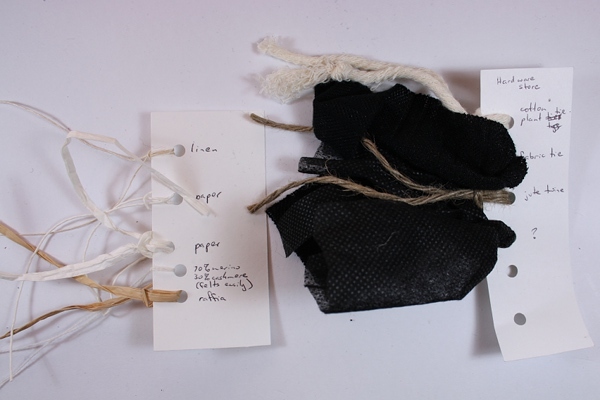 On the left are my gleanings – some sacks that previously held coffee beans ( I can cut strips like rag weaving, or take out individual threads), some shredded silver paper, and some very odd synthetic things – I have no idea of their original purpose. Not super exciting. Next outing was to Feeling Inspired, who sell beading, jewellery and craft supplies. My friend Des had used some of their neoprene tubing at the weaving week with Liz Williamson (blog post 14-Jan-2012 – if you click on the link you can see her work on the right in the top photo). I now have a couple of diametres of neoprene, some fine wire, what I think is waxed cotton cord, various colours of something labelled “strong and stretchy” and a whole heap of anonymous somethings. I don’t know their properties and potential and I can’t read it up. I’m going to have to feel, experiment, and figure it out. Excellent!